Ian Frykberg, a former political journalist and TV executive turned sports rights mogul and deal-maker, died in Sydney on Sunday at the age of 68. 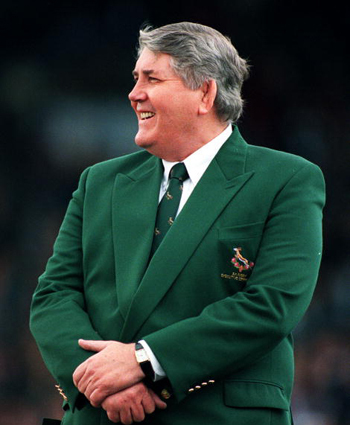 His legacy is the deal he brokered which established professional rugby in the southern hemisphere establishing a blueprint for the global game. A few months before his death, in an interview with Martin Gillingham, Frykberg gave his perspective on the events of 1995. South Africa was entering the final months of its preparations to host the World Cup when news broke in Australia that Rupert Murdoch and his News Limited company were preparing to launch Super League. It posed a direct threat. Rugby’s traditionally professional code needed new talent and Union players were likely targets. The three major southern hemisphere unions recognised it was time to act. The transition to professionalism was gathering momentum. It was inevitable and they knew that if they didn’t grasp the nettle someone else would. Officials from South Africa, New Zealand and Australia agreed that their power would be in their unity. SANZAR (an acronym of the three participating nations) was created as a concept. To turn it into reality they needed the support of the players and broadcast partners. Yet no television deal of its kind in rugby union had ever been done before. They needed someone to represent them: someone who knew the game, the marketplace and the powerbrokers involved. Ian Frykberg was the chief executive of CSI, a company which specialised in representing sports governing bodies in the sale of their television rights. Having played club rugby in Sydney he had a close empathy with the game. He’d worked for both Murdoch and Kerry Packer. Crunching numbers and then selling them to television executives is what Frykberg did. He was also the perfect SANZAR child: born in South Africa; raised in New Zealand, and making his living in Australia. Yet even with the best man in place, the deal they planned almost got away. Beneath a blanket of secrecy a rival bid, the Kerry Packer-supported World Rugby Championship led by former Wallaby Ross Turnbull had already secured the signatures of most of the three nation’s leading players. Among those showing interest in TWRC were Sean Fitzpatrick, Phil Kearns, Will Carling and Francois Pienaar, the captains of New Zealand, Australia, England and South Africa. Pienaar revealed details of how he represented the Springboks in their negotiations with TWRC and South African rugby supremo Louis Luyt in his excellent autobiography Rainbow Warrior. TWRC was the rugby equivalent of Packer’s 1970s cricket circus and its appeal extended north of the Equator: Turnbull had gone to Europe and was claiming to have clinched agreements with more than 400 players. But what they didn’t have, according to Frykberg, was the complete support of a broadcaster. Even so, he admits the project almost succeeded. “Many players from the South African provinces, including most of the Springboks, had signed agreements to play in this tournament,” Frykberg said. “But as things went on, and there was no money, and while Kerry Packer backed it he wasn’t prepared to bankroll it. The agreement that brought SANZAR into formal being had been signed on the eve of the World Cup final in Johannesburg, The following day, the final chapter of rugby’s Invictus tale was written and the captain who had been in the thick of, first the negotiations with TWRC and then later with Luyt and SANZAR, lifted the William Webb Ellis Cup. So just what was the price of southern hemisphere rugby and how did Frykberg arrive at the number? “There was no benchmark against which to measure it,” Frykberg said. “There were no global competitions like that in rugby. “Along with a colleague of mine, Jim Fitzmaurice, we sat ourselves in the Mount Nelson (a Cape Town hotel) for a week just going over figures and going over figures. And then when we were on a plane from Cape Town to Johannesburg, I said, ‘Listen Jim, I don’t think this is enough, let’s double it’. A few weeks later the key stakeholders, including Luyt, met in Sam Chisholm’s flat close to London’s Hyde Park to thrash out the final deal. Chisholm, managing director of BSkyB, was Murdoch’s man responsible for overseeing News Corp’s global television interests outside the United States. He was also a friend and former colleague of Frykberg.